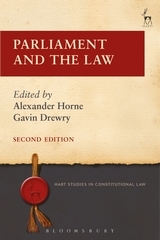 This collection of essays by leading academics, lawyers, parliamentarians and parliamentary officials provides a critical assessment of the UK Parliament's two main constitutional roles-as a legislature and as the preeminent institution for calling government to account. Both functions are undergoing change and facing new challenges. 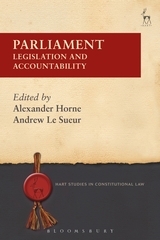 Part 1 (Legislation) includes chapters on Parliament's emerging responsibilities for pre-legislative scrutiny of government Bills and for evaluating proposed legislation against explicit constitutional standards. The impact on legislation of the European Union and the growing influence of the House of Lords are also examined. Part 2 (Accountability) investigates how Parliament operates to scrutinise areas of executive action previously often shielded from effective parliamentary oversight, including national security, war-making powers and administrative justice. There are also chapters on parliamentary reform, including analysis of the House of Commons 'Wright reforms', parliamentary sovereignty, privilege and the European Convention on Human Rights, Euroscepticism, and parliamentary sovereignty and the regulation of lobbyists. The book will be of interest to anyone who is curious about the work of Parliament and is aimed at legal academics, practitioners and political scientists. 2. What is the Parliamentary Scrutiny of Legislation for? Alexander Horne is Legal Adviser to the House of Lords European Union Committee and Honorary Lecturer at University College London. Andrew Le Sueur is Professor of Constitutional Justice, University of Essex.